Aurora Receptions was established in the 1970s and has been running as a family business under the same management since 1990. 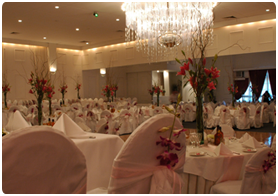 Aurora is one of the oldest venues in Melbourne and has been servicing Melbourne’s wedding industry, catering to a variety of cultures and cuisines since it’s humble beginnings. Aurora prides itself on its customer service and home-made quality food and variety of cuisines including: Modern Australian, Mediterranean, Middle-Eastern and Asian. If you would like to make an appointment to visit our venue, you will be meeting with one of our original owners, Garry or Laura. We are sure they will make you feel welcome and offer you the best package to suit your needs.